USB flash drive or nicotine vaporizer? A Juul is an example of an e-cigarette device that is designed to be discrete. It fits into the palm of the hand and looks very similar to a USB flash drive. Smoking this device is often referred to as “juuling” among teenagers. Teenagers no longer have to sneak off to the bathroom for a smoke due to the invention of e-cigarettes. Now teens are able to take a couple of puffs from a vaping device wherever they are, even in the classroom. While this would be impossible with cigarettes due to the clouds of smoke and smell of burning tobacco, e-cigarettes only leave behind a light vapor cloud with a pleasant scent. The vapor is easily exhaled into a backpack or clothing and the scent can be mistaken for lotion or hand sanitizers. Initially, electronic devices were designed to have the look and feel of a traditional cigarette and were marketed towards adults trying to kick the habit. Now devices are made to resemble common items you would expect a teenager to have, such as flash drives, pens, and lip gloss. These new designs serve as camouflage, giving teens the freedom to vape without raising adult suspicion. The liquid, or “juice,” that is placed in a device comes in a variety of flavors to enhance the experience. The flavorings are similar to ones used in foods, so they seem to be safe, but there is a big difference between ingesting the flavorings (where they are broken down in the gut) and inhaling them into the lungs. There are no studies that tell us what happens to the lungs when the juice is vaporized and inhaled over long periods of time. In addition to flavorings, nicotine is commonly found in e-juice. Unlike the flavoring, nicotine has been studied for years in traditional smoking studies. We know for certain that nicotine is a highly addictive substance, and the younger the person is when the habit forms, the more difficult it is to quit. While vaping is often perceived to be a safer option than cigarettes, there is no scientific evidence to support that assumption one way or the other. The “Tide Pod challenge” is a surprising trend that started out as a joke in a video which eventually went viral… and the rest is history. Suddenly, department stores have to lock up laundry pods and parents have to keep the detergent hidden from their teenagers. While the videos are cringe-worthy and defy common sense, most times it has only caused a terrible taste in the mouth for those who choose to take on the challenge. However, there are instances where the challenge has gone very wrong. When the pod bursts open in the mouth and the detergent is released, the person will likely gag and choke on the detergent’s nasty taste. While the person is gagging, the detergent can get into the lungs (aspiration) causing breathing difficulties such as coughing, wheezing, and gasping. If the aspiration is significant enough, a pneumonia can develop. In some instances, people have been placed on ventilators to breathe for them while their lungs heal. If the detergent is swallowed into the stomach, there can be prolonged nausea, vomiting, and diarrhea. Sometimes, the detergent squirts into the eye, which burns and stings and may cause a chemical burn, even if the eye is flushed right away. The salt and ice challenge involves pouring a small pile of salt on your body, usually on the arm. An ice cube is placed on top of the salt which causes an intense burning sensation. Combining salt and ice produces a chemical reaction which absorbs heat from the skin, causing that area of skin temperature to lower substantially. The end result can be frost bite or significant burns to the skin. The longer the ice cube is left in place, the worse the damage and scarring will be. Did you know that the poison center can help with chemical burns? If your teen has done the salt and ice challenge and you have questions, call the poison center. We can discuss the symptoms and the correct course of action that needs to be taken. Alcohol abuse has always been a trend at teenage parties; however, there are new ways in how the alcohol is consumed. One trend is to soak gummy candies in alcohol. The gummies get larger as they soak up the alcohol, but they still look like candy to the casual observer, so it is easy for teens to hide them without attracting attention. Hand sanitizer is another potential (and potent!) source of alcohol. While the sanitizers taste terrible, there are methods online to modify the taste. Have you heard of AWOL? It stands for “alcohol without liquid” and involves breathing in vaporized alcohol fumes. 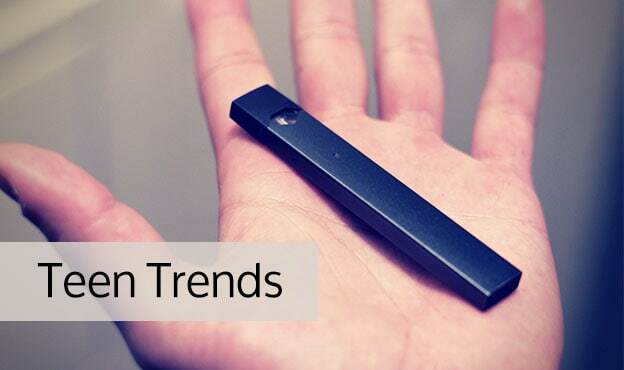 This trend started out in bars where only adults are allowed, but teens have found instructions on how to vaporize alcohol using common household items on the internet. Alcohol vapors are well absorbed in the lungs and can lead to significant levels of intoxication. Since the stomach is by-passed, vomiting is not triggered when large amounts of alcohol are inhaled. Another popular trend is combining alcohol with energy drinks. The caffeine content in the energy drinks causes the person to be “wide awake drunk” and changes the their perception of their level of intoxication. Also, the user is able to drink over a longer period of time, and therefore ingests larger amounts of alcohol. Teen trends are difficult to predict and can be challenging to manage. For any questions or concerns about teen trends, call the Poison Help line at 1-800-222-1222. Specially trained nurses and pharmacists are available 24/7/365 to answer your questions. The service is free and confidential.